Minus desktop application was something which I had never heard about before and it even had a Linux version. 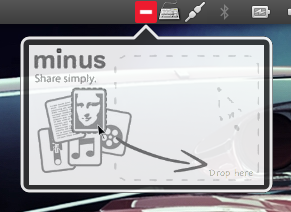 Minus desktop application lets you drag-n-drop photos and files into the Minus taskbar and instantly upload onto Minus. Those of you who use free image/file hosting websites other than min.us extensively might want to consider using min.us instead solely because of this very interesting desktop application. I have downloaded and tested Minus desktop application in my Ubuntu and I have to say it is fairly simple to use and very useful too. 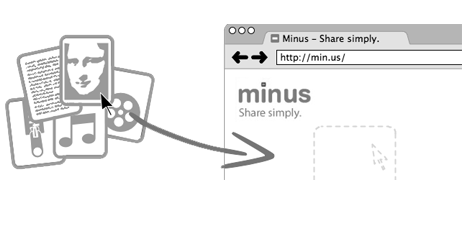 It lets you upload photos and files directly from your desktop to Minus by a single drag-n-drop action. In my experience, the application was very slick and fast though I totally hated its default red icon. Windows and Mac versions of the application is also available for free download. Special thanks to our reader Scott for letting us know about this nice little application. If you have a tip to share with us or simply want to comment about our blog in general, please don't hesitate to use our Contact Us page. We would love to hear from you.